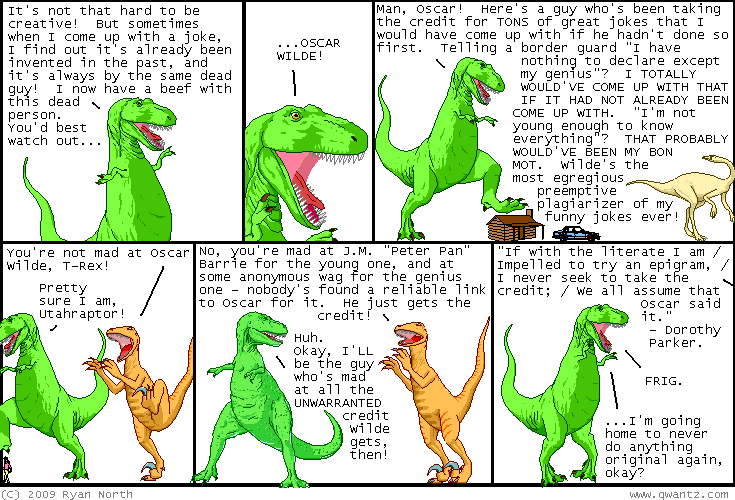 Dinosaur Comics - March 26th, 2009 - awesome fun times! –We make New Year's Resolutions for a reason! March 26th, 2009: Hey I'm having an art show! An art show with Chris "Dr. McNinja" Hastings and Chris "Achewood" Onstad! It's called TITANS OF SMALL TOWN and it's a one-night gallery show at 303Grand in Brooklyn! CHECK OUT THE DEETS. I am painting some paintings that assemble together, VOLTRON STYLE. One year ago today: i walked into a low-hanging support wire on the weekend so hard that it drew blood. luckily, my extreme height has ensured that my head already covered in protective calluses, so no real damage was done!